Chaat masala (Hindi चाट मसाला, Urdu چاٹ مصالہ; also spelled chat masala) is a spice powder mix or masala used in South Asian cuisine, primarily in Indian, Bangladeshi and Pakistani cuisine. It typically consists of amchoor (dried mango powder), cumin, coriander, dried ginger, salt (often kala namak), black pepper, asafoetida (hing) and chili powder. The ingredients are combined and served on a small metal plate, polystyrene plate or a banana leaf, dried and formed into a bowl, at chaat carts, especially in India, Bangladesh and Punjab (Pakistan) and Sindh in Pakistan. Chaat masala is also sprinkled on fruit, egg toasts and regular salads in India. Some spice brands market an alternate spice mix called Fruit Chaat Masala. The Fruit Chaat Masala tastes less of cumin, coriander and ginger, but more of chili pepper, black salt, amchoor and asafoetida. Street vendors usually mix their own chaat masala, which is sprinkled on chopped up fruit or fresh vegetables (such as raw daikon in North India and Pakistan) unless the customer asks for it not to be added. Sometimes black salt with chili powder alone is used. 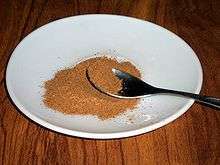 ↑ "How to Make Chaat Masala, from indianfood.com".